The problem, if you want to call it that, is that putting a commercial logo on school property violates a 1999 Board policy entitled “Commercial Free Schools.” So the staff asked us to waive the policy to allow the donation to go forward. It was an interesting discussion, and we all agreed that what we really need is an update to the policy to guide how we will and won’t recognize donors to the school district. This is especially timely because of the plan to rebuild 135 Van Ness to become the new site of the Ruth Asawa School of the Arts. That project will require significant private philanthropy, and donors who give millions to projects like this rightly expect to have their contributions acknowledged in some kind of public and permanent way. In the end, we agreed to the basketball court and retaining wall recognition, but asked for more consideration of the backboard idea. 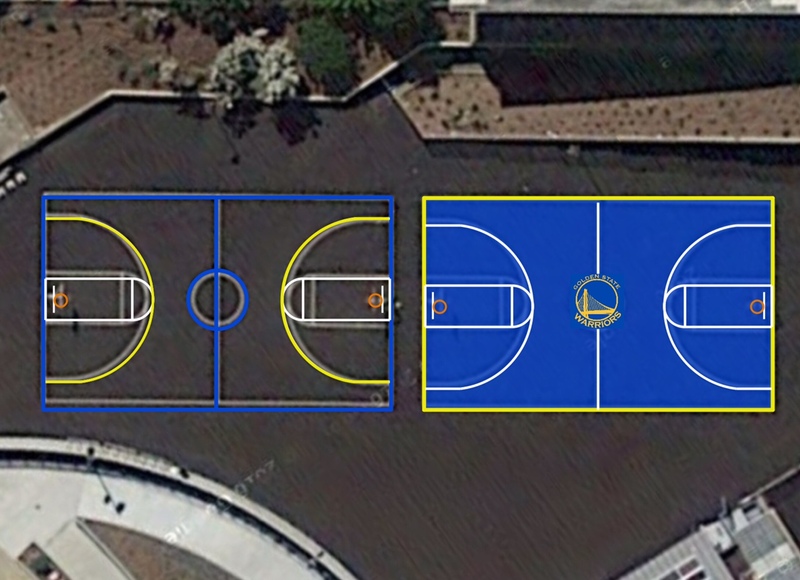 I’m very grateful to the Warriors for the gift and I think the students at Willie Brown will be thrilled with their new court. As the Superintendent said, “students at Willie Brown will know that the Warriors have their back, and that their heroes care about them.” And, allowing corporate logos like this, even for such a good and positive cause, is a bit of a slippery slope that we need to navigate very carefully. We also made a significant change to the student assignment policy — one that will not in my opinion affect most people adversely, but is nevertheless significant. Watchers of our student assignment policy will recall that starting this year, the middle school feeder system was supposed to go to “initial assignments” for 5th grade students currently enrolled in an SFUSD elementary school and moving up to the 6th grade in the following year. So, for example, if the initial or automatic assignment policy were to go into effect, a 5th grader at Lafayette Elementary school would receive a letter this October saying they are being assigned to Presidio Middle School for 2017-18, without the family having to file an application, because Lafayette feeds into Presidio. Problem #1: Willie Brown Feeder Pattern. Currently, families at Carver, Drew, Bret Harte and Malcolm X have two feeder options: Giannini or Willie Brown for Drew, Aptos or Willie Brown for Carver, Martin Luther King or Willie Brown for Malcolm X, and James Lick or Willie Brown for Bret Harte. This is problematic if all other 6th grade students in the district are receiving an automatic assignment to their feeder schools, since we wouldn’t know what middle school families at these four elementary schools would prefer. We discussed a number of options at committee. I suggested asking 5th grade families at the four schools — there aren’t that many of them, maybe 100 total — which feeder they prefer for their children and letting the families choose. Others suggested assigning 5th graders at these schools to the highest performing feeder choice. The staff suggested feeding all four schools into Willie Brown, but the Board rejected that option due to the obvious segregated pathway this option would create. Problem #2: Not enough Language Pathways. We have so many language pathways in elementary schools that it is not possible to feed students into a language pathway in middle school unless you create separate feeder patterns for language programs. For example, Cleveland and Guadalupe Elementary have Spanish bilingual pathways, but Visitacion Valley MS, where both schools feed, does not have the corresponding language pathway. We have already come up against staffing challenges for language programs that make it impractical to keep opening up new dual language pathways in middle schools, and yet providing equitable access and automatic assignments to dual language pathways in middle school would require just such a move. So the staff proposed instead proposed adding an additional tiebreaker — a language pathway tiebreaker — to the middle school enrollment process. All students would receive an initial assignment to the General Education pathway at their feeder middle school. Students in language pathways who want to continue in a language pathway in middle school would then apply to language pathways using the existing Round 1/March placement process. Students would receive a tiebreaker for the appropriate language pathway at any middle school, plus a tiebreaker for their feeder middle school if that school also offers the appropriate language pathway. Are you confused yet? I certainly was, and all of us on the committee felt this was a very drastic, confusing and unworkable change just so that we could continue the commitment to move to initial assignments as promised in the existing policy. So here’s where we are: after a long discussion at the Student Assignment Committee, board members asked the staff to come back to us with a substitute motion that would instead delay initial/automatic assignments for at least one year, so that we would have more time to look at our options and engage families. I recognize that this decision kicks the can down the road, but it’s also probably the least disruptive change we could make at this late date because essentially, families will experience status quo in middle school assignment: the system will work exactly as it has in each of the last five years. This entry was posted in BOE and tagged commercial free schools, middle school feeders, recap, student assignment, Warriors. Bookmark the permalink. Again, the change was PROPOSED but NOT ENACTED. The Board felt this was too drastic of a change to do at the last minute and so instead we will keep the system as it has been for the last five years. You will need to put in an application, but you will receive a middle school feeder preference to Roosevelt. Hope this helps. We had an expectation that our son, who is in an immersion program at CIS, would get an initial assignment to an immersion program in middle school at Roosevelt. That was a part of the School Board’s policy and was our expectation. Now, just months before we need to register him for middle school, the Board abruptly changed its policy. This seems really unfair and is a failure of planning on behalf of the Board and District. We are now concerned that this lack of planning will leave us without a place in the program. This is especially true because our immersion program is oversubscribed (with an extra class of immersion 5th graders) with no plan to accommodate the extra kids in the program next year. These last minute changes to the policy really should not be happening. Will we need to find a different program now after investing almost six years in an immersion program? That was the staff’s proposal but was not enacted. The system remains as it has worked the last five years. This sure is a sticky wicket! I think it is important to ask whether these organizations would donate without recognition of this sort. I’m guessing that many would, given the tax incentives and the fact that they can publicize their own generosity — not to mention the many altruistic motivations they may have. It may not be necessary to “give away” pieces of our schools in order to raise the money we need. And, as Todd points out, there may be other ways to recognize donors that target adults rather than our students. Something else nags at me with this issue, and that is how it may impact the female athletes that play on this court. I’m sure a lot of the girls are huge warriors fans, but the NBA is not a “club” they can join, and it strikes me that we may be inadvertently sending a subtle message to our female athletes about their “lesser value” in professional sports. Should we make some effort to counter that? I suppose ultimately it’s up to the coaching staff to decide what their players need for encouragement. But I wanted to raise the question. So I’m confused by this. Does this mean that rising 6th graders coming from the Mandarin immersion programs at Starr King and Jose Ortega won’t get automatically placed in the MI program at Aptos? The Warriors should get recognition for their contribution, but the recognition should be directed at adults. Common Core standards demand that we train children to be critical thinkers who recognize the intent behind any text. The team is still a for-profit entity and their intent is clear. What is the name of the kids’ team? That’s what should be on the court. As we rally support for the Arts Center, the commercial-free rule should stay in place. Companies should already have sufficient motivation to support the project – they need an innovative local talent pool. A school business partnership could work in selective instances. I believe the high schools still have academies such as a legal or finance academy. If a business is willing to partner with resources why not give them recognition: The Morrison and Forester Law academy, Charles Schwab finance academy, or Apple Information Science academy. That seems better to me and more realistic the aspiring to be a professional basketball player.